Following on from 2005’s ‘Human After All’ and 2010’s ‘Tron : Legacy’ soundtrack, it’s hard to ignore the media circus which has encapsulated the release of Daft Punk’s new offering ‘Random Access Memories’. It’s easy to forget how long the French duo have been churning out the hits, and their expansive back-catalogue span some 16 years. Over that time, Daft Punk have managed to create some of the most iconic dance music of any artist, and there is always an undeniably timeless feel to everything they do. In terms of musical style, they are electronic for the most part, but never shy away from the use of live instruments whenever they need to. 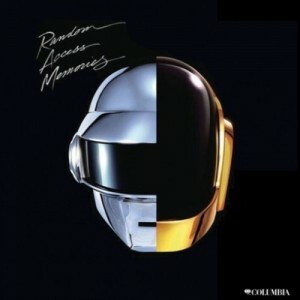 ‘Random Access Memories’ is possibly their most ‘instrumental-driven’ output yet. First up is gnarly disco groove ‘Give Life Back to Music’. This is vintage Daft Punk and demonstrates immediately how quietly brilliant they can be. It’s perfectly crafted and reeks of a lot of their classic tracks, without being too overstated. It feels like a warm-up. For a record as hyped as this one, it’s a surprise to hear such a low-key intro. Following track ‘The Game of Love’ starts quietly with a lush, gentle melody which washes over you. Enter robotic voice, crooning the first of many love songs on this album. Auto-tune is ever present throughout this record, but it’s such a familiar music tool for Daft Punk it never feels out of place. ‘Giorgio by Moroder’ features (as you would expect) electronic musical pioneer and hugely influential producer Giorgio Moroder performing a monologue about his life. Throughout this track a number of different microphone were used for each part of Giorgio’s story, from the periods of time he describes. Only a very hard-core sound engineer would be able to tell the difference, but it’s a great tribute by Daft Punk to their craft, and the love they clearly have for their subject. It feels like a piece of history is being made. In terms of the auto-tune/robot voice aesthetic, no track does this with more conviction that ‘Within’. What begins with a Chilly Gonzalis piano workout, then becomes an incredibly sad love song, sung as you would expect, by a machine. It’s the juxtaposing of beautifully played live instruments with electronic vocal that most ignites the track. This track demonstrates how Daft Punk are able to polish an idea to within an inch of its life. It’s cold, but also heart-wrenchingly beautiful. Next up is Julian Casablancas’ vocal for ‘Instant Crush’. Again heavily vocoded, Casablancas turns in his usual cool, throw-away performance. This is easily the next single from the record. It has a slightly darker tone to the later Pharrell tracks. The hook is delicious, and this is one of the tracks which I found myself going back to most. It’s dramatic, almost ‘indie’, but yet works perfectly as a dance track. ‘Lose Yourself To Dance’ is the first of the Pharrell tracks on the record, and this one is the lighter of the two. Amongst what has gone before (and what is to come) this almost feels like a filler track. It’s low key, but it does deliver a delicious funk baseline courtesy of Chic bassist, Nile Rogers (who features throughout the whole record). The track builds slowly and will get inside your bones, although for its position in the track listing, it feels a little light on substance. Mid-album ‘Touch’ features seminal songwriter Paul Williams, and it really is the pivotal point of the album. Sounding from the start like as dramatic as any show tune, it never drops its act. As per a couple of the previous tracks, it follows a familiar theme of machines striving to become human. The emotion in William’s vocal performance is incredibly infectious, and the whole piece is sung with enormous conviction. The musical setting for the track is as much about the build-up, as it is to the much lighter disco mid-section. It feels like it’s part of a much bigger story, almost like it’s been taken from a West End/Broadway musical. The closing lyric ‘You’ve almost convinced me I’m real’ is delivered with so much feeling and emotion it’s almost tragic. Buried within an album of largely dance tracks, this is an absolute gem. The much played Pharrell Williams vehicle ‘Get Lucky’, is as at home among this record as you might expect. Light, airy, and with an infectious groove likely to get into your head and stay with you for days. Glistening in more Nile Rogers groove, it’s already a classic. Toward the back half of the album, we’re on familiar ground for the French duo, and no track is more typical than ‘Beyond’. This is second track co-written with Paul Williams. Follow a huge orchestral build-up it kicks into a full disco workout, with tons of polish. In a similar vein, ‘Motherboard’ drifts along, bringing things toward a much calmer tempo, almost bordering on a chill-out track. Another standout track is 80s drenched ‘Fragments of Time’, this time featuring vocals from US House producer Todd Edwards. It could have been released in 1983, and there isn’t a tinge of irony in the production or musical style. It’s hugely refreshing to hear a track with so much conviction. It further demonstrates the diversity of ‘Random Access Memories’ as an album. Daft Punk aren’t afraid of where they source their grooves. This track is almost a tribute to Michael McDonald for Christ sake. Panda Bear takes the reins for what will no doubt become a huge floor filler in ‘Doin’ It Right’. Vocals perfectly crafted describe exactly the ethos of Daft Punk; ‘If we’re doing it right, everybody will be dancing’ echo throughout the track. It’s another slow tempo, but aching to be remixed. I’ve no doubt this one will reappear in multiple formats and remixes. Final track ‘Contact’ is ‘Random Access Memories’ big crescendo, and what begins with a short vocal sample, builds into a huge soundscape of electronica and galloping orchestra. Daft Punk really want to end on a memorable note, and they surely do. It easy to hear the band (particularly the drumming) and feel how tight they are. For a duo known for their electronic music, this is a formidable ‘band’. It’s impressive to the end and crammed full of grooves and drops, it’s impossible to listen to this on low volume, and deserves to be played as loud as possible. The mid-section almost sounds like the track is taking off as it builds and builds. The ending will leave you a-gasp and ready for another listen. ‘Random Access Memories’ is a seminal record in anyone’s book, whether your personal taste is rock, indie, dance or R n’ B, there is literally something in there for everyone. As expected it is all done with an incredibly fine polish, and none of it feels like they’re out of their depth, or are trying to please too many people. It sounds like they’ve been making records as diverse as this for their entire career. Many people will miss out on hearing this, being the slightly sickening level of hype which surrounded its release. This is a shame, as I’m sure it will become one of the records of the year. That said, despite the hype, these tracks will be around for a while. It’s a timeless record, intelligent enough not to patronise, and understated enough to avoid being too modern. Daft Punk are one of the most successful and enduring dance acts around today, and after hearing this, you can see why that is. This entry was posted in Daft Punk and tagged Daft Punk, Random Access Memories by admin. Bookmark the permalink.